I call it karma, you call it what you will. But by chance I met up with a guy who shares as much passion, dedication, and love in his work as I do in mine. I only thank God we are not in the same line of work, because I don't think we would have become the truly great friends that we are today. Frank Niedospial and myself hit it off from the first minute. I was in awe of his talent, and watched him as he went about lettering up one of Troy Winks racecars. On the other side of the coin, he was asking me how the heck do I make those websites look so awesome, and the rest my friends is history. I kept after Frank to let me design him a website, but with being right in the middle of the busy season it took some time, which is fine with me, quality takes time. Frank and I kept on throwing out ideas, and it's funny as hell, his idea's matched my idea's of what he would like to have his site look like. It had to be a fun site, in a business manor, but a fun business manor, one that would showcase how Frank really is, and that is a guy who is loving life, and having fun while he is getting paid to do it! Needless to say, Frank is a proud owner of a BTM website, and he is thrilled with it, I think he is anyhow? Nah, just fooling, he freaking loves the site, and it's getting thousands of views per year. I'm talking real people visiting his site, not fake computer generated hits, I'm talking the real deal. I can't say enough about Frank, he is as down to earth as anyone you ever wanted to meet, and I'm proud to say we are more then good friends, we are blood brothers. If you need professional lettering done right, then there is only one person you need to call, or email, and that is Frank. Visit his website and take a good look at the quality work he puts out, plus of course take a good look at the design of his site. We both are Masters "in our own minds". 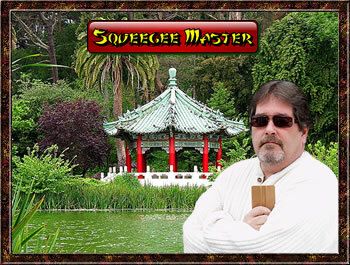 Frank was taught by Master Squee-Gee Lee in China.